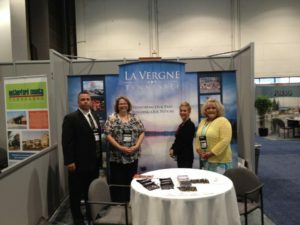 LaVergne is sending a delegation to the 2017 retail conference hosted by the International Council of Shopping Centers, scheduled May 21-24 in Las Vegas. I won’t talk about taxpayer dollars sending people to Vegas because it’s just a fact that the city can handle a conference of that size. There are tens of thousands of people who attend and thousands of exhibitors – all working toward either finding a location to build a retail/restaurant business or others wooing these same retail/restaurants to their community or shopping center. You’ve got people there who label themselves “deal-makers” trying to connect these interested parties and trying to also connect them with project financiers. You’ve got salesmen. You’ve got developers. You’ve got competition. A lot of competition. We were able to get appointments on-site (“impossible to do” we were told!). We were able to confirm Walmart (we heard LaVergne would never get one!). Year Two of the former team, we set up our own exhibit booth (pictured above) because in Year One we were given the crappy times to staff the booth representing the entire county (we felt we could better represent our city than another city representing our city). Now another crew will head to Vegas to woo would-be businesses. You can say what you will about wanting this or that, but I can assure you that the team will already have talked with whoever you’re suggesting. For example, we talked with Bojangles at least six years ago and they just now opened. It’s a long, long process. Who else did we talk with? Golden Corral (they were somewhat jerky to us), TJ Maxx (we had them, but they landed in Smyrna… same with Hobby Lobby and Five Below), Applebee’s (we thought we might be getting them, but… time will tell), Dairy Queen (we had an investor, but DQ betrayed LaVergne so our next option was to reach out to Tastee Freeze. Which we did). The list goes on and on and on. We talked with hotels. We talked with grocers. We talked with sandwich shops. etcetera etcetera etcetera We literally talked with hundreds of retail stores and restaurants. Wear comfortable, but nice shoes. You will do a LOT of walking. You are there on our dime and representing us, so make good use of your time. Be there when the exhibit opens. Be there when it closes. Bring lots of business cards with you and hand them out! Collect lots of business cards. Write on the back exactly what you’ve promised or what you’ve talked about because you won’t remember. Do not have your photo taken in a casino or with show girls. Do. Not. Just don’t. Do enjoy yourself during your off time. Go to Red Rock Canyon (my favorite!) or Hoover Dam. Always consider the following statement carefully before acting or speaking, “Is this something I want to see on social media or on the news?” It is Las Vegas, after all. So good luck to Alderman Melisa Brown, Alderman Calvin Jones, Kyle Brown, Tom Broeker, Rachel Heggen, and Alderman Jason Cole. Make us proud. "Viva Las Vegas! GO LaVERGNE! ", 5 out of 5 based on 1 ratings.